It’s official: “sedentary” is now a dirty word. A number of well-publicized recent studies have shown that sitting for more than three hours a day can cut two years off your life expectancy. It’s the “sitting is the new smoking” phenomenon. Health experts now recommend that desk-based workers spend four hours a day standing or doing “light activity” such as walking. Clearly, moving more is important. The problem is that most offices aren’t set up for physical activity. We walk into the building in the morning, stand on the elevator, and sit down at our desks, where we remain sedentary until our stomachs tell us it’s time to eat. What’s the alternative? Unless your company offers a fitness center, your onsite choices for exercise in the workplace are probably pretty limited. But there is one movement tool that most workplaces ignore – a tool that’s too often designed to be hidden behind doors and inaccessible: the staircase. In a multi-floor office building, staircases have traditionally been viewed as for emergency use only, with elevators given prime real estate as the preferred mode of vertical circulation. What if we gave stairs the visual prominence that elevators currently have? Studies have shown that when stairs are conveniently located, visible, and attractive, more people will choose to use them. 1. Convenience: Locate stairs on the building’s main path of travel. If that’s not possible, use signage to prompt use. 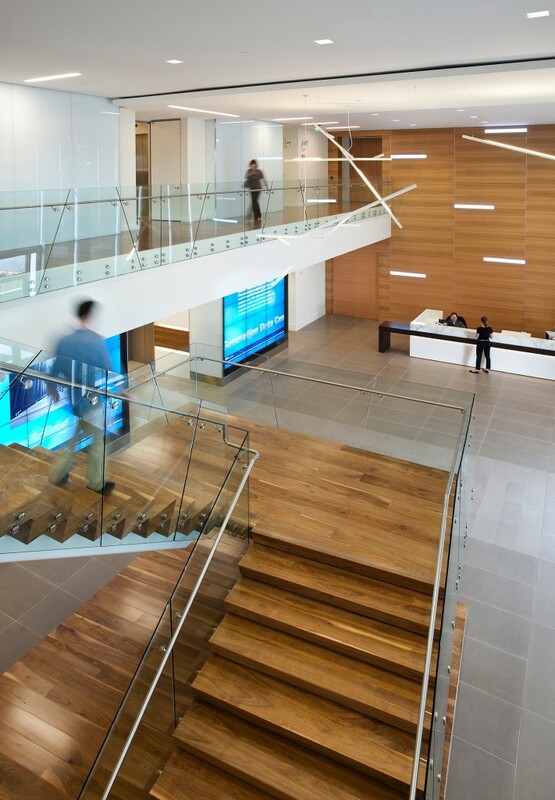 At Brocade Communications Systems, San Jose, the stairs are an architectural feature of the lobby, and lead directly to the EBC. 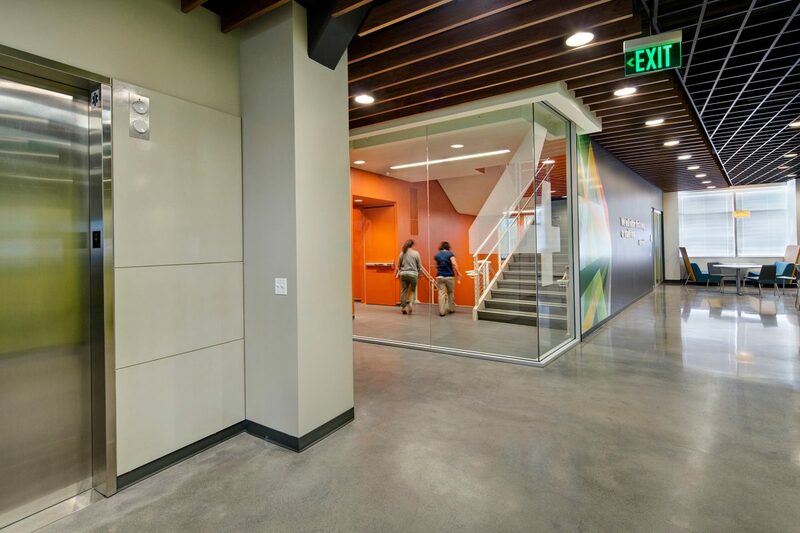 Bright signage directs attention to the “emergency” stairs at Juniper Networks (Sunnyvale, CA). 2. Fun Factor: Make the stairs an enticing destination by incorporating unusual design details. 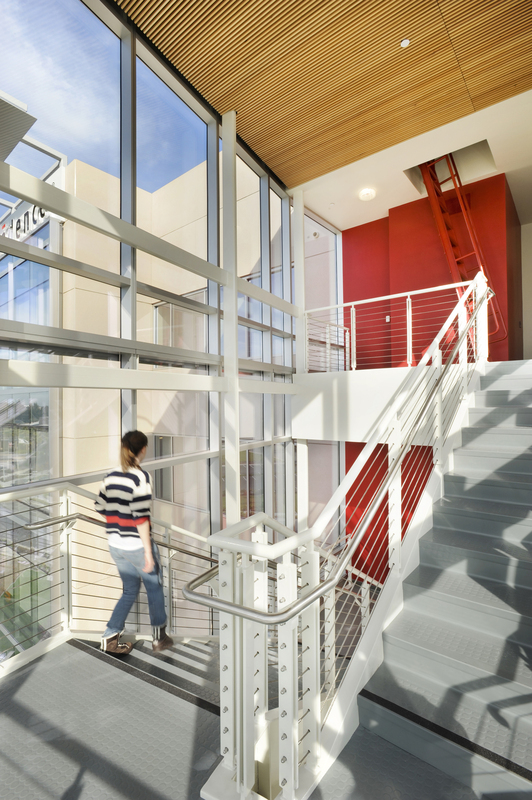 Interactive elements in particular have been shown to increase stair use. 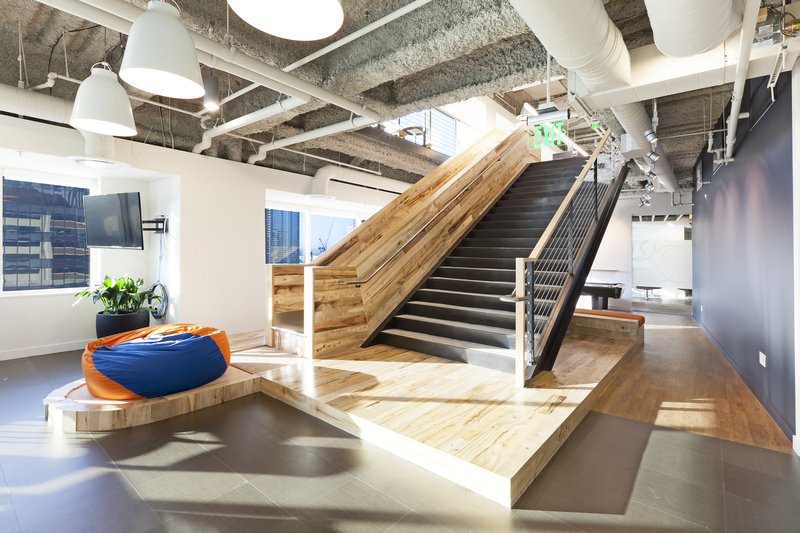 RMW recently included a slide next to one client’s staircase, turning this feature into a fun zone. 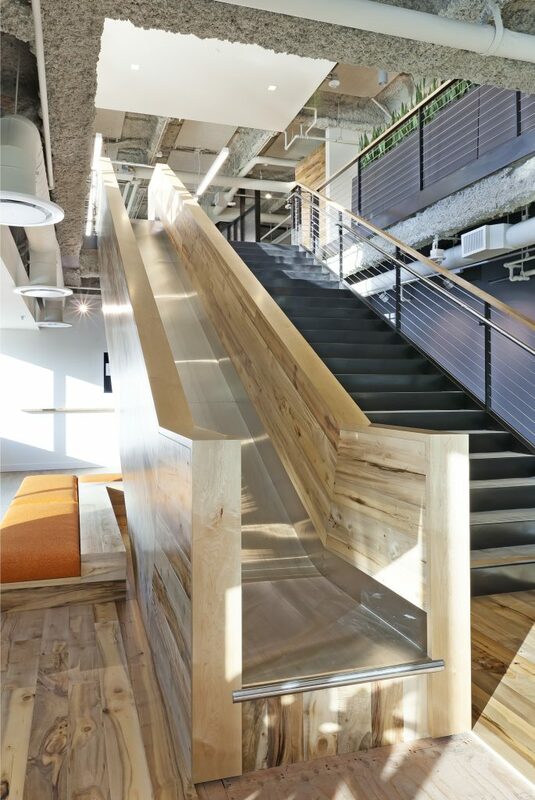 Fun design elements – such as the slide installed next to the stairs at these offices in San Francisco – turn the pedestrian into the playful. 3. Visibility: If fire separation is required by code, consider fire-rated glass enclosures to maintain visibility. Views to the outside, where possible, also increase the attractiveness of stairs. At Juniper Networks, the stairs are a clear alternative to elevators, thanks to glass enclosures. A bright and sunny stairwell at Cadence Design Systems in San Jose, CA. 4. 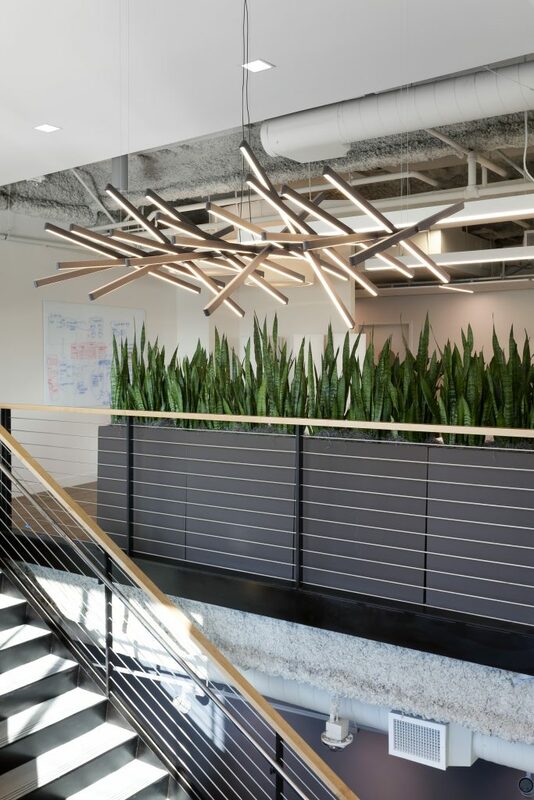 Sensory Delight: Interesting articulations, finishes, green walls, lighting, access to views, and artwork make a stair more appealing, and motivate people to explore. 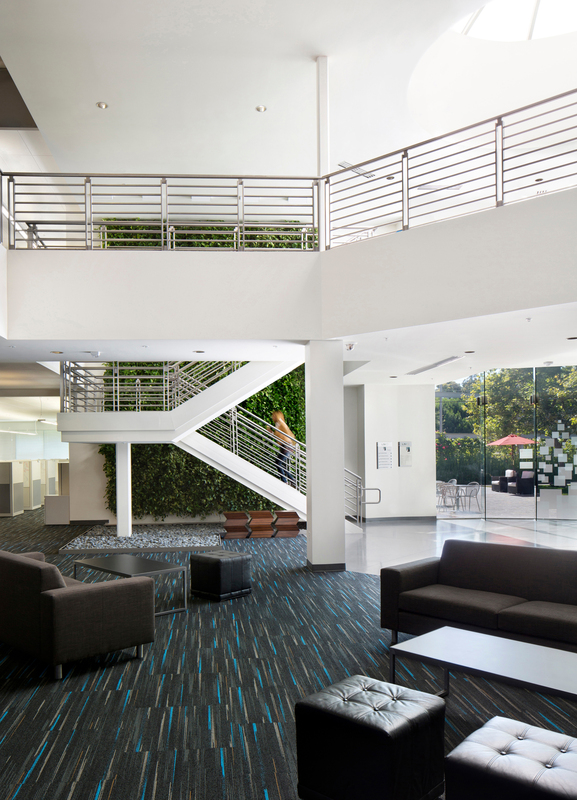 A two-story green wall turns a staircase at Avago (formerly LSI) in San Jose into an indoor-outdoor experience. 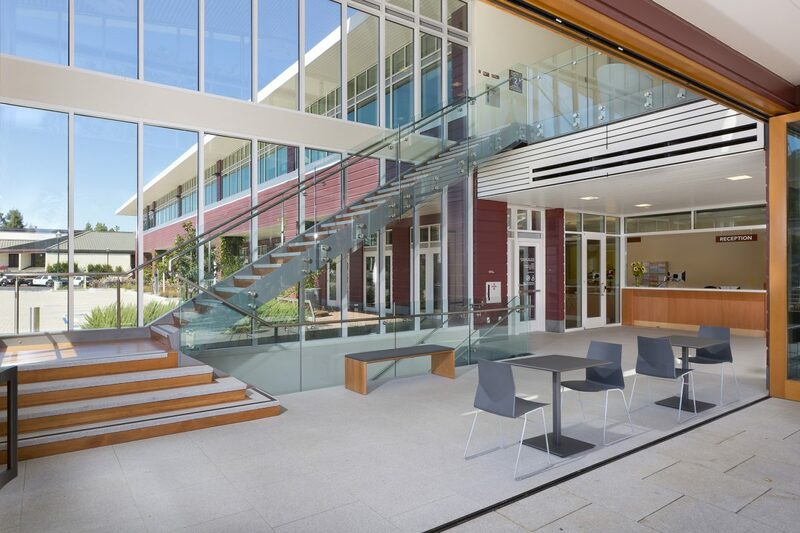 A feature stair combined with an open split-level landing draws the eye at the City Administrative Offices in Novato, CA. 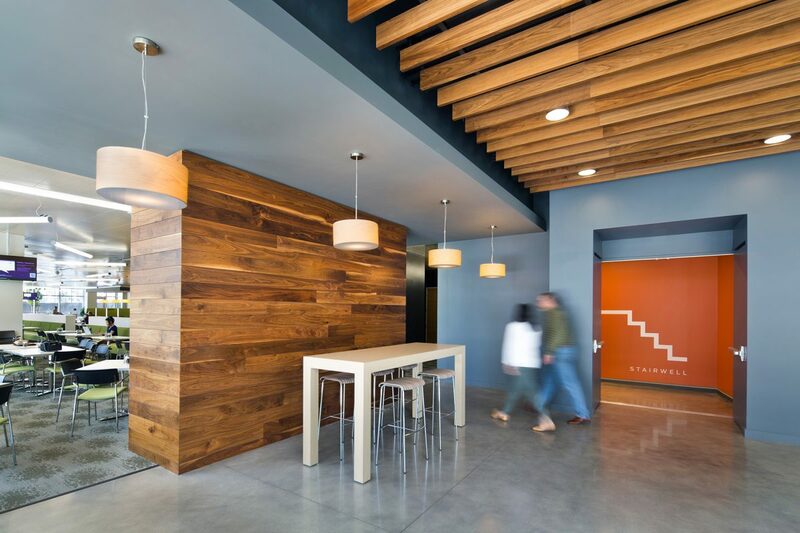 Interesting lighting acts as a beacon for the stairs at this San Francisco office. Gary Koshaba is a principal at RMW, where he focuses on creating working environments for corporate and legal clients. In addition to climbing stairs, he gets his exercise by fishing and playing golf. Reach him at garyk@rmw.com.